We arrived in Hamburg at 9am and took the green line train to Central Station towards Wedel. I’d booked to stay at Generator hostel on a recommendation and after staying in the hostel chain in Dublin I didn’t need convincing. 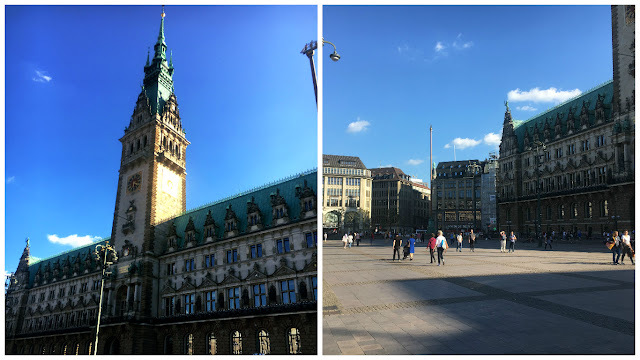 Luckily we were able to get a 6:00 am flight meaning we’d have the entire day to explore the city and then the next couple of days to really get to know Hamburg before heading East to Berlin. 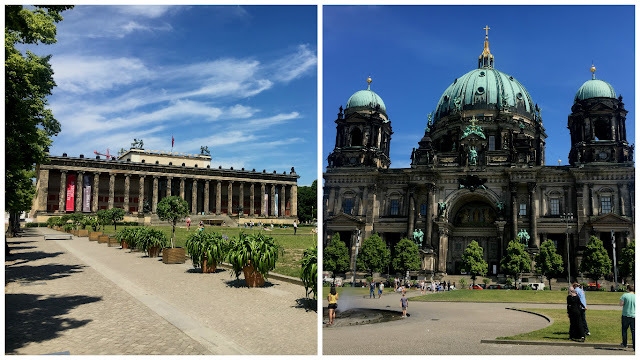 We decided to explore both Hamburg and Berlin during our time in Germany due to how easy it is to travel from Hamburg to Berlin using Flixbus. 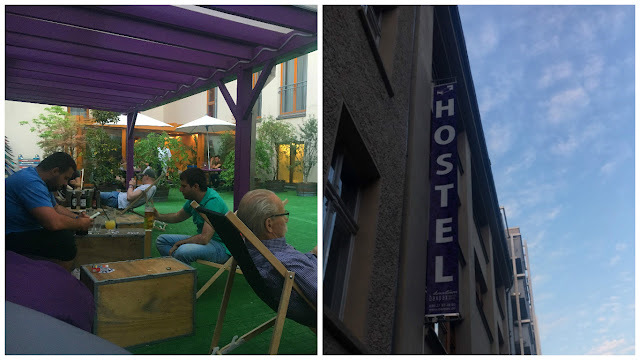 Generator hostel, Hamburg is in a great location a mere 100 meters from Central Station also known as Hamburg Hauptbèahnhof – Central Station works just fine for us non-German speakers. Check in is at 2.00pm but like all Generator hostels we were able to use their luggage lockers to dump our bags before heading out to explore depending on size the lockers only cost a couple of Euros for several hours. Our first act as tourists in Hamburg was to buy a day train pass for the train and subway for €11.80 which meant we could travel around the city at will during our time in Hamburg. The ticket allows up to 5 adults to travel together as many times as they please in one day. A worthy investment for anyone spending a few days in Hamburg, especially couples or small groups. Like any European city tram tickets are rarely checked but I’m too afraid of the fine to jump on without a ticket. €11.80 or €50 fine? The risk is yours. The subway is pretty simple once you get your head around the routes. 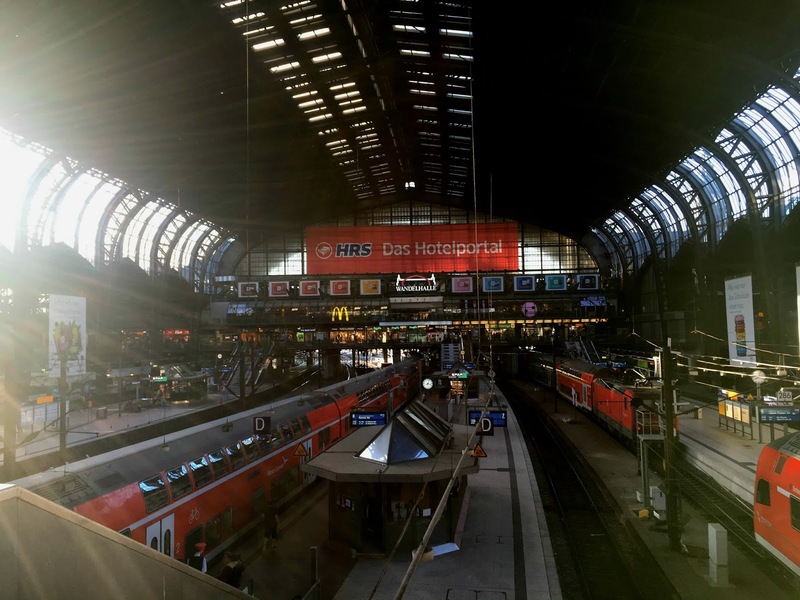 Our most frequented station was Reeperbahn in the St. Pauli district of Hamburg – a popular and infamous tourist haunt. If you like cheap booze and can ignore the highly flaunted prostitution add Resperbahn to your Hamburg checklist. 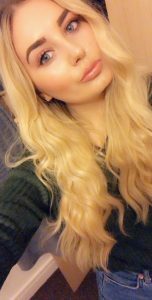 If the discomfort of in-your-face prostitution is too much for you, don’t worry it’s confined to specific areas and as a couple or female you’re more than likely to be ignored. A lot of the prostitution in Hamburg is hidden behind large metal walls with big ‘No Females Allowed’ signs at each entrance. So you can happily enjoy a night on the town without witnessing any propositioning at all. A few girls stand on corners or wander up to the occasional stag-do walking around looking lost. The girls are mainly dressed in very little and easy to spot if are looking to avoid it. Tourism in Hamburg is predominantly stag do tourism. Many groups of enjoying a stag generally decent on Hamburg through the European summer months but there is always a noticeable flow of stag tourism in Hamburg. Our flight from Manchester taught us this and we can officially say we saw every type of stag do from Hawaiian shirts to drag and everything in between. 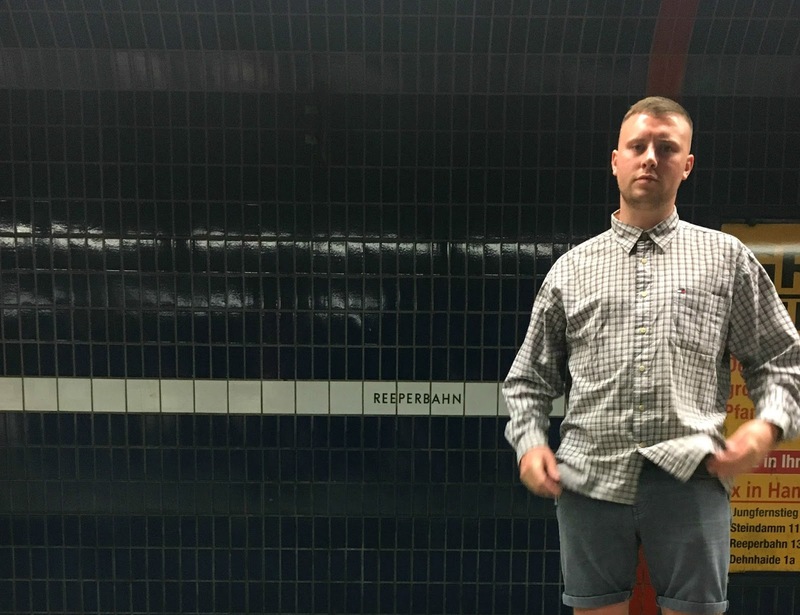 Needless to say British stag-do tourism is infamous the world over and if you do want to avoid feeling like you are in a wetherspoons during an England match, the Reeperbahn past 10:00pm should be avoided at all costs. 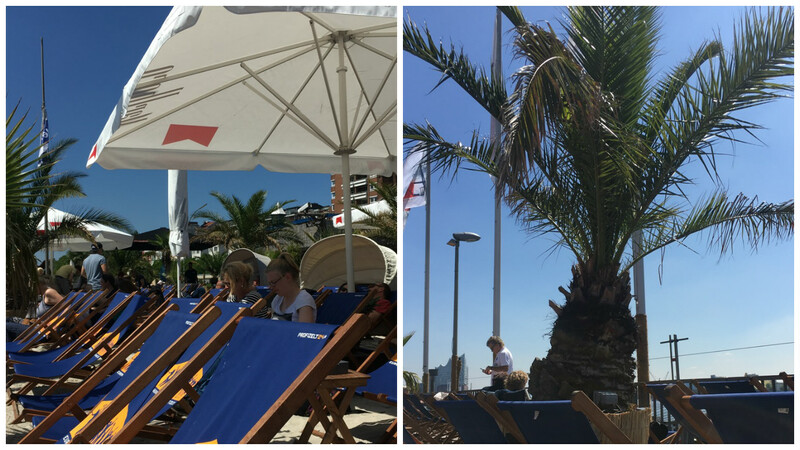 Alternatively, If you’re able to look past the darker sides of tourism in Hamburg there’s a lot to be experienced. Aside from the cheap drinks of the Reeperbahn St. Pauli is home to many bars, restaurants and cheaper eats. A must in Germany’s most expensive city. We found ourselves on the banks of the river a couple of times ‘Hamburg Del Mar’ is definitely a highly recommended beach bar with artificial sand. You’ll pay a little more for drinks but there’s a great food menu and even better tunes. 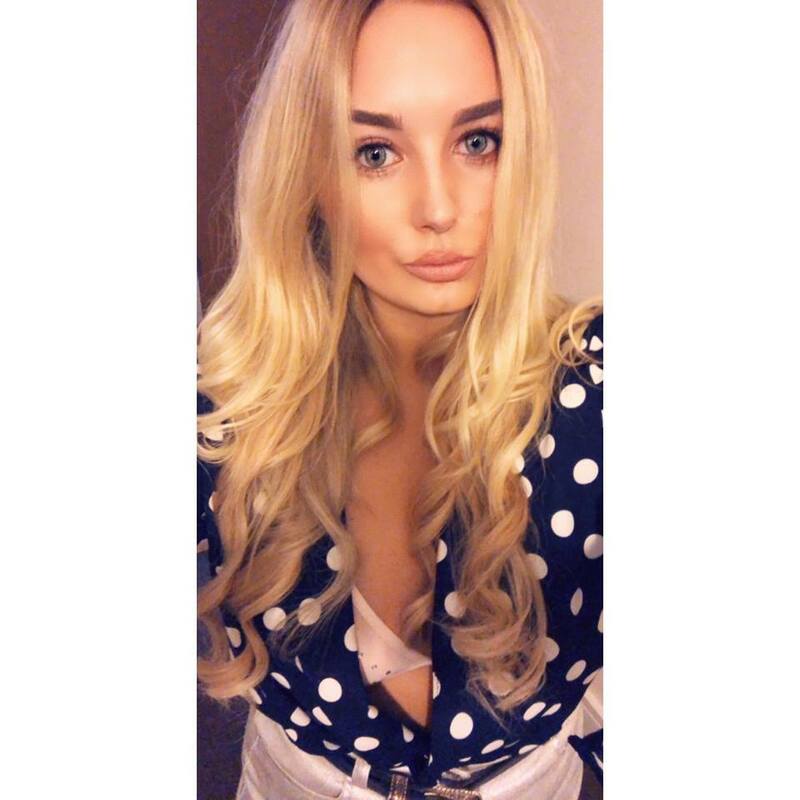 Watch out and stay clear of Bei Teresa – We witnessed the rudest staff who actually shouted at us for only having a drink in their empty beer garden. Not worth a visit to be spoken to like that. Avoid this place. For the cheapest eats in Hamburg fast food places are often the best – as I’ve mentioned Hamburg is the priciest city in Germany. We found ourselves (and when I say we I mean Jamie) often on the lookout for Lebanese restaurants for kebabs, falafel and lahmacun (Turkish Pizza). Germany is also home to widest range of sausage known to man. Curry Wursts, bratwursts and blood sausage along with schnitzel are usually always on the menu for non-veggies. HafenCity is Hamburgs large scale regeneration project just a little further up the river from St. Pauli. We found ourselves here once after a painstakingly hot Subway ride. We walked the restaurants and bars on the waterfront and drank iced coffee in the sun. If you’re looking to dine out and want to avoid the Reeperbahn and Central Hamburg take the subway to HafenCity for a quiet evening on the waters edge. 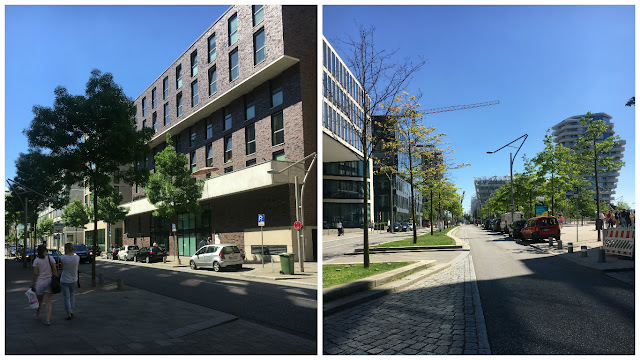 Central Hamburg is another world compared to the seedy tourist trap of the Reeperbahn. 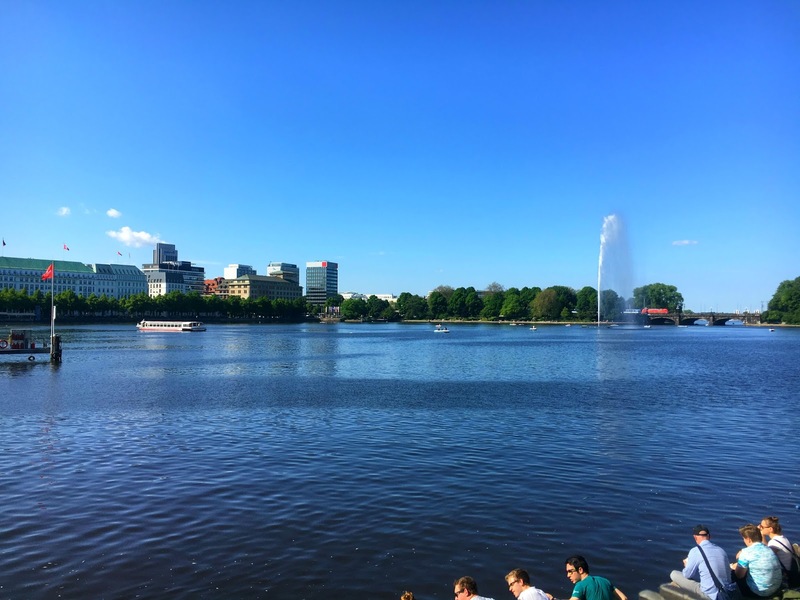 The Inner and Outer Alster Lakes are the dominating feature of the central area of Hamburg. Take a boat trip from the Inner Alster Lake and be wowed at the views of the city from the water. Walk around the Inner and Outer Alster Lakes to enjoy the passing boats and scenery. The Inner Alster Lake is where we spent most of our time in Hamburg -The Binnenalster as its officially known is a great place to grab an ice cream and enjoy the evening as late afternoon is usually when the crowds arrive to chill by the waters edge. Stop for a Spirtz at ALEX (The restaurant with a balcony overlooking the water). Make sure you stop by the Town Hall Hamburg Rathaus and St. Michaels Church. For World War Two tourism head to St. Nicholas’ Church where only the tower remains along with a memorial. Hamburg is a fun city, but a city that you’d only ever want to spend 2-3 days in. The expense aside, Hamburg can be explored in a few days with all the main attractions a subway ride apart. For weekends and short city breaks and of course stag dos I can see why Hamburg has become an increasingly popular destination of choice. As mentioned stag do tourism in the city of Hamburg is very prominent and it’s hard not to spot the large groups of lads around the city. From Hamburg to Berlin. Leaving Hamburg we took a bus from the central bus station which is located conveniently outside the Central Train Station. The three hour journey from Hamburg to Berlin cost us €13 per person, we decided to leave at 6.45am to ensure a full day to explore Berlin. Flixbus operates throughout Germany and other European cities. It’s a great cheap alternative to long distance trains. I would recommend taking a bus from Hamburg to Berlin rather than the pricier train option. Once you have taken the bus from Hamburg to Berlin, Germany. You will arrive in one of the many bus stations in the city of Berlin. Take the train towards Berlin city centre, it’s worth buying a day pass for the S-Bahn and U-Bahn for €7. This will allow you to shoot around this city all day and utilise your time. 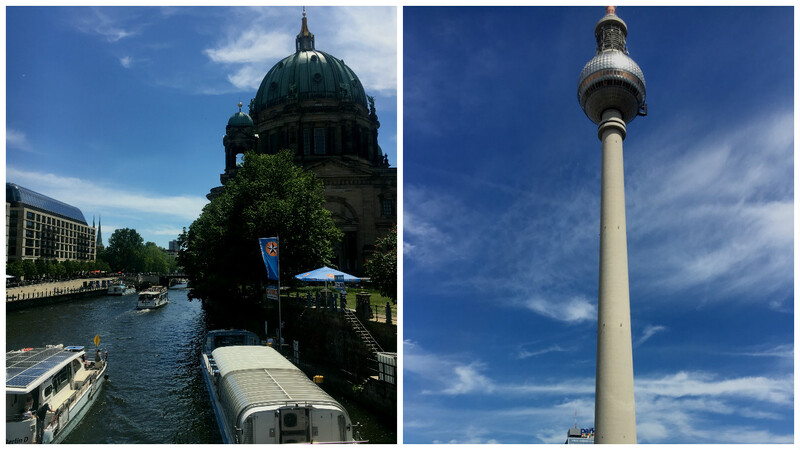 We only had 24 hours in Berlin which meant only one day to explore this famous Germany city and all its attractions. It is possible to spend only 24 hours in Berlin if you are organised and plan your itinerary based on the main attractions you want to see. If you do decide to travel from Hamburg to Berlin it is advised to split your time evenly to avoid having only one day in Berlin. Our first stop in Berlin was our hostel BaxPax Downtown Hostel a €10 hostel which I booked primarily for the rooftop terrace and bar which happened to be closed on a Sunday. I can’t remember seeing this online during the booking so check first. For a city like Berlin we noticed a lot of bars and restaurants to be closed on a Sunday so perhaps time your visit for a Friday or Saturday. After check in we left the hostel asap as mentioned we had only 24 hours in Berlin and wanted to make the most of our time as possible. It was still early morning when we left our Berlin hostel and we were only a ten minute walk from The Brandenburg Gate the number one on our to do list. Jamie has been to Berlin previously and from memory knew that we could head to Brandenburg then the Jewish War memorial then the ‘fhürerbunker’ car park which are all a small walking distance from each other. 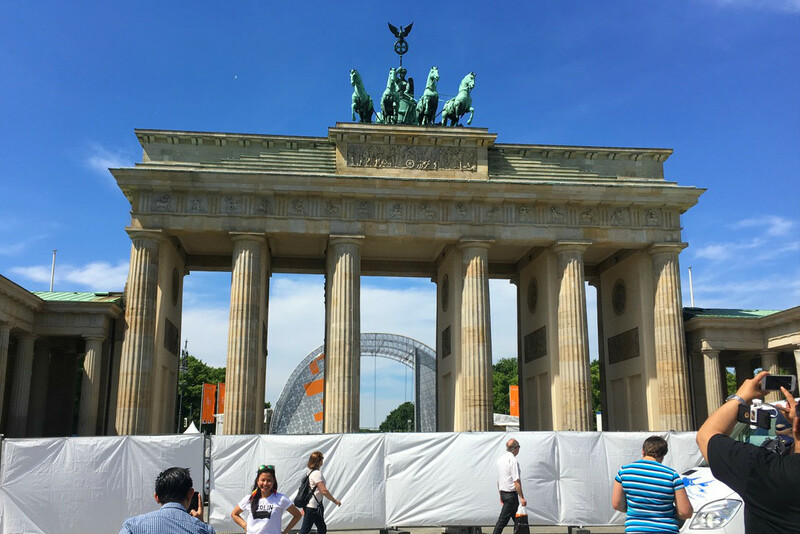 If you’re looking to get to this area by train head to the Brandenburger Tor station which is the closest. For us, the walk from BaxPax Hostel was simple and made more sense to walk than spending our precious limited time on a train. We had arrived after after what appeared to be a festival or event. The whole of the Brandenburg gate area was closed off with fencing and all of the surrounding roads too as officials took down tents and marquees. The whole area surrounding the Jewish War Memorial was the same. Which didn’t make for the best photos I must admit. We spent some time wandering the Jewish War Memorial, a peaceful place where I noticed all tourists being incredibly respectful and solemn despite things I’ve read previously about selfies and silliness at tourist attractions with dark origins. 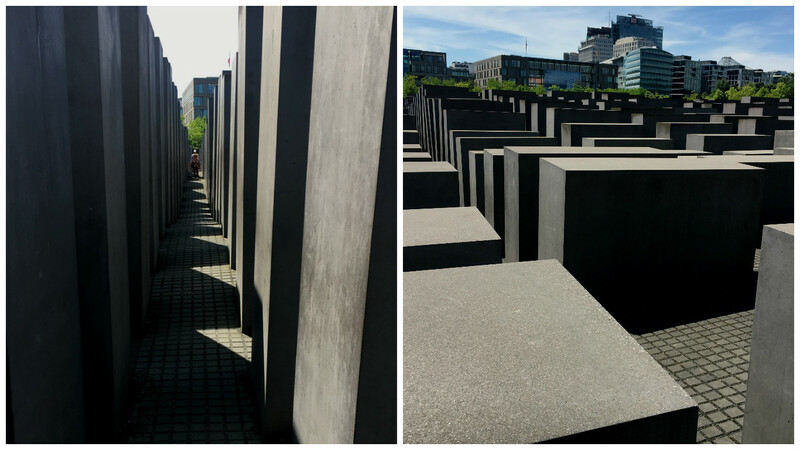 The Jewish War Memorial should top any Berlin itinerary, the piece of art exists to honour the millions of Jewish people who lost their lives during World War Two and I felt it was only appropriate to pay my respects to them. If you’re looking for places to visit for a one day in Berlin itinerary then the Jewish War Memorial should certainly make your list along with the top 11 things to do in Berlin. The next on our Berlin list was to head to the cathedral, a truly stunning and icon building I had been dying to see. 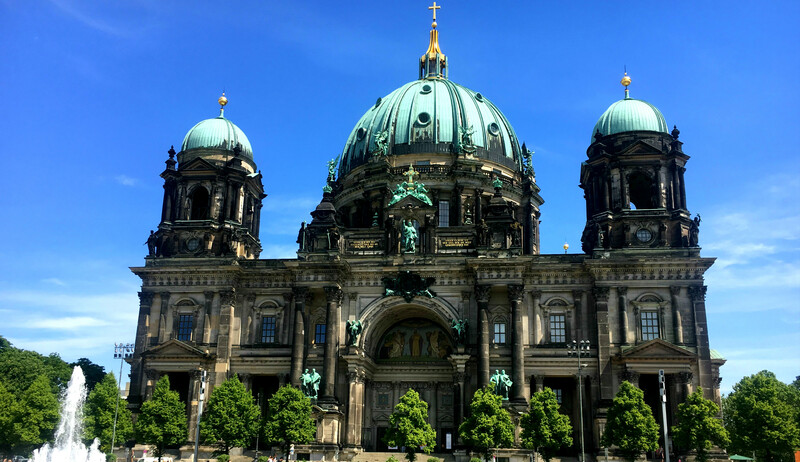 Berlin Cathedral is also a short walking distance from the Brandenburg gate. We were able to walk past the British Embassy where people had laid flowers and lit candles to pay their respects those who tragically lost their lives in Manchester in a tragic terrorist incident that had only recently happened. It was quite touching to see and I felt very moved that tourists and locals had taken the time our of their day to visit the British Embassy to pay their respects. It got me questioning why Britain would choose to tear itself away from our European allies. 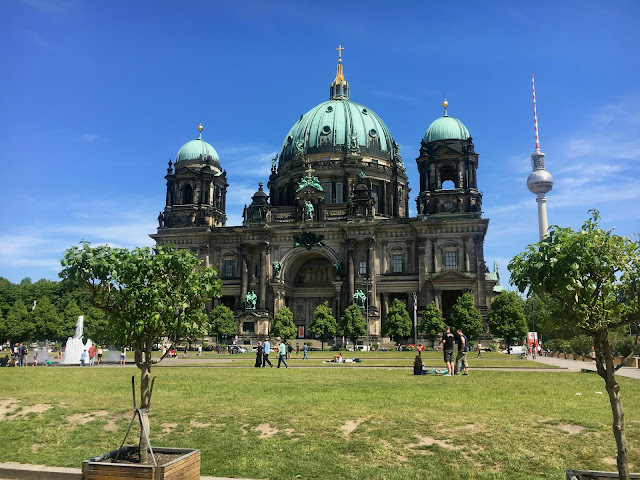 If you plan on spending only one day in Berlin then I recommend adding Berlin cathedral to your bucket list, its a must see and in a beautiful location. Berlin Cathedral surpasses any expectations, especially with the blue sky day backdrop. The incredible structure is so photogenic I almost couldn’t stop taking pictures of it. We spent a few minutes sitting down outside admiring the structure. 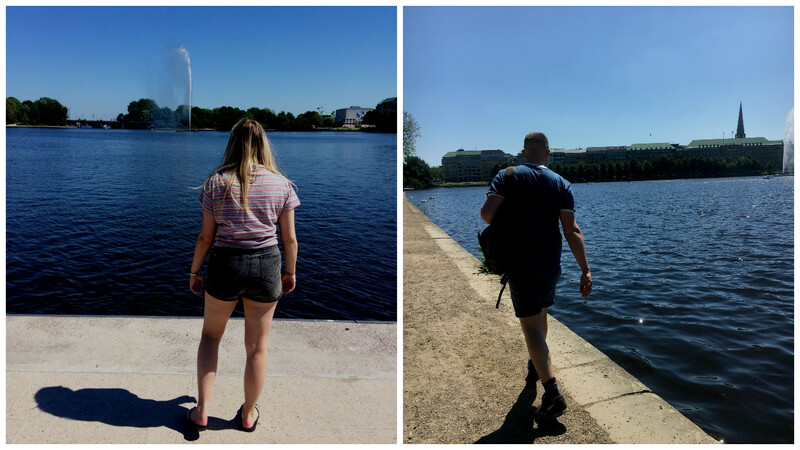 After all our walking around the city an ice cold drink was in order, we located the first cafe on the banks of The River Spree that runs through Berlin, the riverside easily became the perfect setting to plan the rest of our day and hide from the beating sun for a few minutes. Drinks prices in Berlin even on the riverside are much cheaper than those of Hamburg. We certainly began to realise why so many locals had told us Hamburg was the most expensive city in Germany. From the Cathedral we had walked towards the tower and Neptune’s Fountain. Many other notable buildings and museums in central Berlin were undergoing renovations in the city we noticed a lot of construction and roadworks. With our morning in Berlin almost over it was time to plan our next move and my sole motivation for visiting the city. 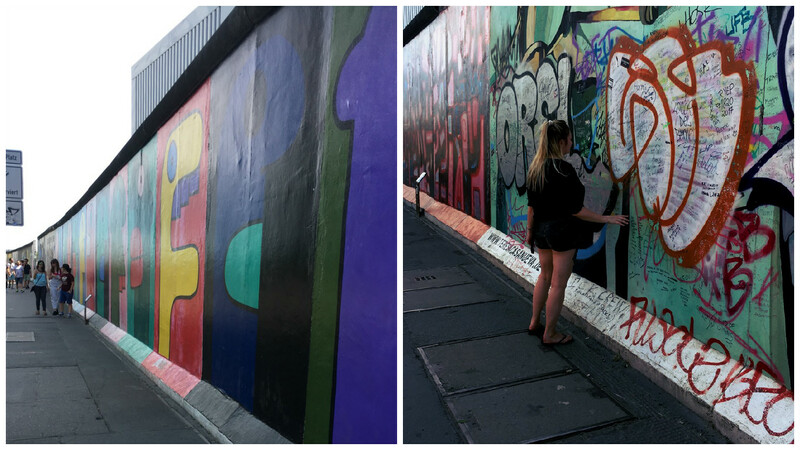 With a one day in Berlin itinerary I was dead set on seeing the Berlin Wall. If you only have a one day trip to Berlin then ensure not to skip the Berlin Wall. This is the one attraction you must add to your Berlin bucket list. To get to the Berlin Wall we took a train to Berlin Nordbahnhof, the heat was at its peak at this point and we walked slowly to the wall and East Side Gallery area with plans to walk as much of the wall as possible. My key reason for wanting to visit Berlin and The Berlin Wall so badly is due the symbol of the wall, the wall itself is a symbol of peace and freedom and marks a great turning point in European history. I once again found myself thinking – why would the British people choose to tear themselves away from our European allies and friends? Whilst dodging other tourists and admiring the artworks on the face of The Berlin Wall it’s natural to forget why the wall still stands in Berlin, as mentioned The Berlin wall is currently an international symbol of Freedom and Peace, it important to bare that in mind during your visit to The East Side Gallery. When you’re tired of walking pop down on the grass on the banks of The River Spree and grab yourself a drink. Being in Berlin only made me regret not spending longer in the cultural surroundings of the city of Berlin and I am already planning my next visit to the German capital. 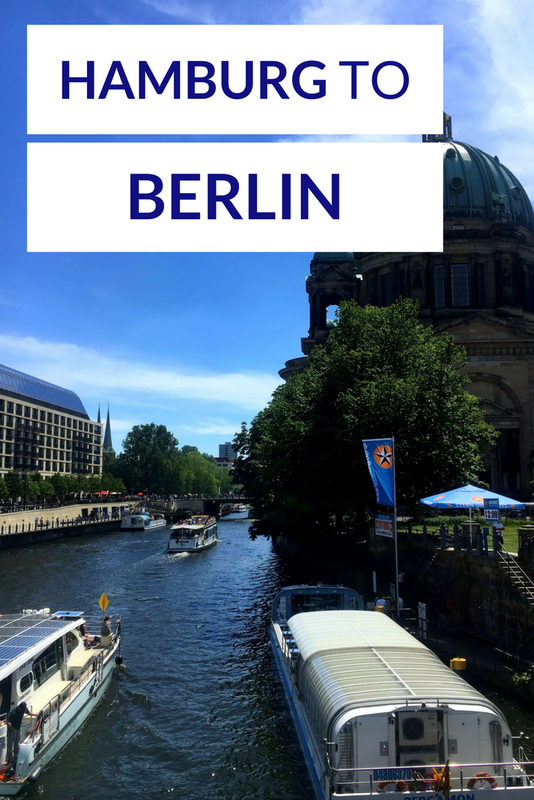 If you need inspiration on things to do in Berlin for one day, my list is a good start, although I don’t believe the 24 hours we spent in the city even did it justice. During the 24 hours we spent in Berlin we got to see some of the city’s most prestigious attractions. 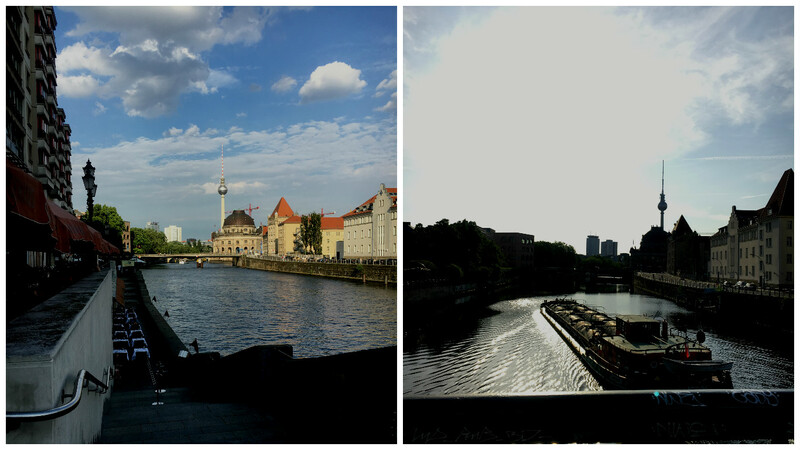 Allocate between 3-5 days to see the city, no more than would be needed to explore Berlin’s full potential. 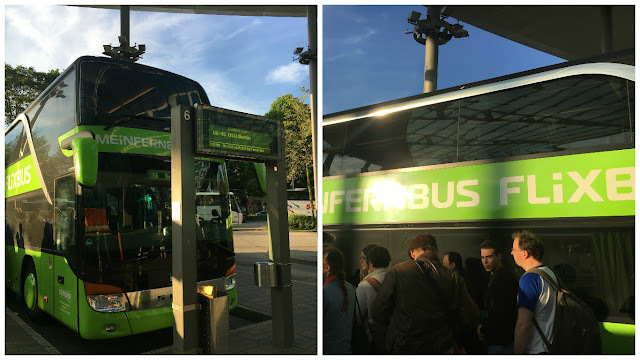 If you’re planning a trip to Germany make sure you set aside time for Hamburg and Berlin and don’t be put off by the journey between both cities, take the journey from Hamburg to Berlin with Flixbus early in the morning like we did.